This is a watershed moment in history, hopefully changing for the positive what your workforce will look like. In the wake of the allegations brought forth against Matt Lauer last week, my little sister and I were hurt and confused. Here was a man we had watched so frequently throughout our childhood hosting the Macy's Thanksgiving Day Parade, hosting our mom's favorite morning show. Here he was, revealed to be a serial sexual predator throughout the entirety of our childhood. In the midst of our shock, my mom sent a text to the two of us: "But my dears, this is a watershed moment in history, hopefully changing for the positive what your workforce will look like." While it is unsettling to watch so many public figures we have put up on pedestals fall, what makes it all worth it is not only that they are being held accountable for their horrific actions, but that we now have the opportunity to change how we raise future generations. No longer will "nothing be done" as it was for so long. Today, Time Magazine named the #MeToo Movement 2017's Person of the Year. In doing so, the magazine spotlighted a seismic shift in our culture by promoting those fighting for advocacy and change rather than those who continue to perpetrate or support assault. One of the most powerful messages conveyed by the cover and its partnering story is that assault is not something limited to one workforce, one institution, or one person. This is a wide-spanning, persisting problem that now has an opposition force with faces, names, and -most critically- voices. 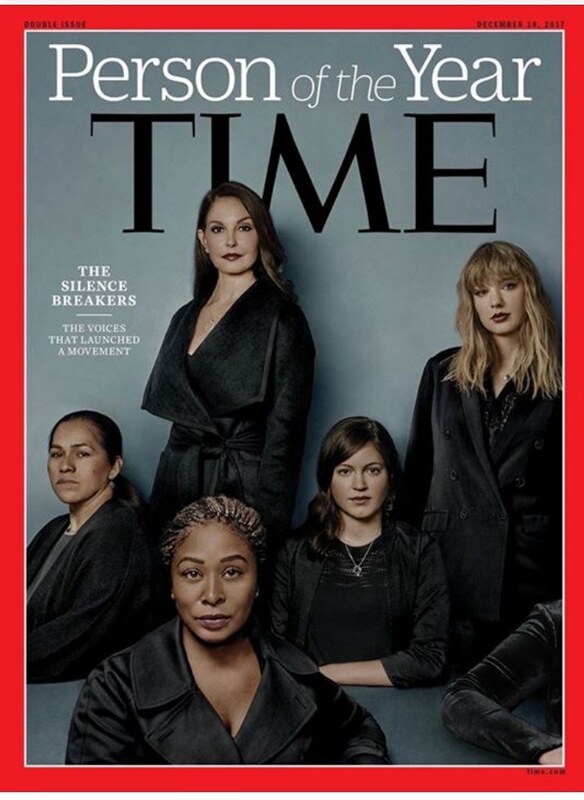 The some of the faces chosen to represent the #MeToo Movement. The cover story spotlights individuals from every walk of life, from celebrities to hotel employees, from women to men. The intention of the variety is to convey how sexual assault can affect us all, but the individuals the story focuses on have all shown us that silence is no longer to be expected or even accepted. Accountability in assault cases and allegations has for so long been unnecessarily forced upon survivors: in recent years, there has been more and more backlash against the trend of victim-shaming, of saying a survivor was "asking for it", or that they didn't explicitly say no, or that they were too intoxicated so they are to blame; even now in the shifting climate surrounding sexual assault, convicted assailant Brock Turner means to appeal partially on account of how intoxicated Emily Doe had been the night of the assault. However, a new New York Times article was released further detailing the decade-long extent of Harvey Weinstein's predatory behavior. The five writers conducted extensive research to discover how deep the acts and cover-ups went. In doing so, they cast a harsh light not simply on Weinstein himself, but those around him who allowed the acts, slander, and degradation to continue for so long. The Time cover and the newest NYT article are incredibly significant and powerful as, for what seems like the first time, the perpetrators are the ones being forced to analyzed their actions, giving power back to the survivors - where it belongs. But this is only the first step, and we need to continue this validating and productive trend lest we regress back to silence and suffering. It doesn't have to go back to the way it was. It doesn't have to feel as though there is no safe avenue for women or anyone in schools, workplaces, or homes. If we don't begin educating our youth that assault is not a display of power or control, instead explaining that it is vile, senseless, and punishable; if we don't begin conditioning them to see the magnitude of pain inflicted on survivors in the stories we read, witness, experience; if we don't start changing the world's perspective to place the blame fairly on the perpetrators instead of on the survivors now, this cyclical system of suffering will never end. It is just as my mom said, just as Taylor Swift said, just as everyone who has been watching and waiting for justice to be served to those with the intention to harm others: this is a watershed moment in history. This is our watershed moment in history, and it is time to act.